Traditional "Limenitidinae" of authors (e. g., Harvery 1991) was a paraphyletic group composed of multiple clades: Biblidini, Cyrestini, Pseudergolini, Coloburini, and Limenitidini. The latter tribe, which is the sister group of Heliconiinae, is here considered to be the "true" Limenitidinae. The rest are more closeley-related to Apaturinae and Nymphalinae (or part of Nymphalinae, in the case of Coloburini). Brower AVZ. 2000. 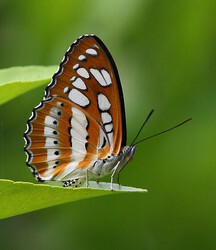 Phylogenetic relationships among the Nymphalidae (Lepidoptera) inferred from partial sequences of the wingless gene. Proc. R. Soc. Lond. B 267: 1201-1211. Harvey DJ. 1991. Higher classification of the Nymphalidae. In: Nijhout HF, ed. 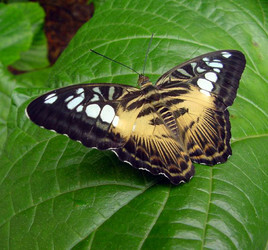 The Development and Evolution of Butterfly Wing Patterns. Washington D. C.: Smithsonian Institution Press. 255-273. Page: Tree of Life Limenitidinae Behr 1864. Authored by Niklas Wahlberg and Andrew V. Z. Brower. The TEXT of this page is licensed under the Creative Commons Attribution License - Version 3.0. Note that images and other media featured on this page are each governed by their own license, and they may or may not be available for reuse. Click on an image or a media link to access the media data window, which provides the relevant licensing information. For the general terms and conditions of ToL material reuse and redistribution, please see the Tree of Life Copyright Policies.